This is one of those wonderful lunches that came together from leftovers…Man, I love it when that happens! 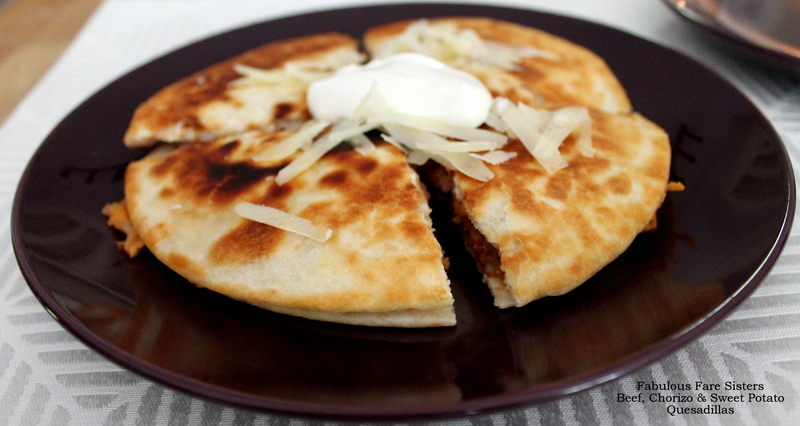 These crispy tortillas are filled with hearty beef, tasty chorizo, sweet potato, refried pinto beans and cheddar cheese. Served nice and warm! Pierce the sweet potato with a fork and microwave four minutes on High. In a bowl, combine the sweet potato and the refried pinto beans along with a pinch or two of salt and fresh ground pepper; mix until smooth. In a medium skillet, heat a little canola oil on medium-high. Spread half of the sweet potato mixture on the first tortilla. Place in the pan and add half of the steak and chorizo slices. Sprinkle with half of the sharp cheddar cheese. Place the second tortilla on top. Brush with a little more canola oil. Brown the tortilla; flip over and brown the other side of the quesadilla. Remove from skillet and repeat with remaining two tortillas. Slice into quarters. Sprinkle with additional sharp cheddar cheese & a dollop of sour cream. 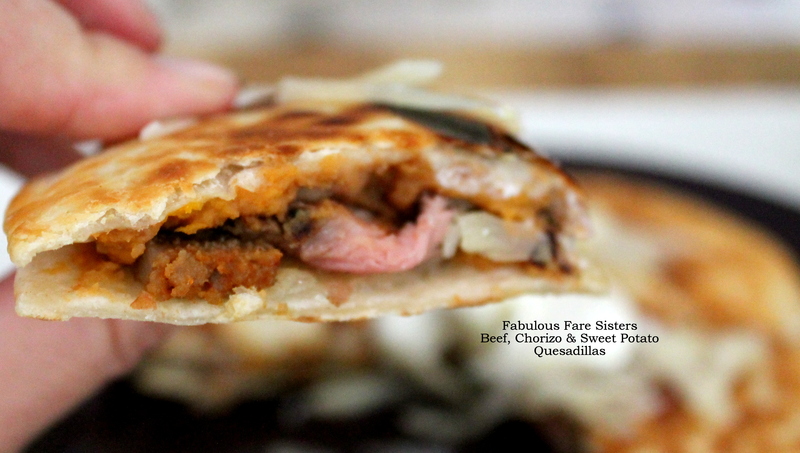 Take a big bite out of this crispy delicious quesadilla! This recipe has been shared on The Pin Junkie, Senior Salon and Inspiration Thursday, Throwback Thursday, Foodie FriDIY, Funtastic Friday, Freedom Friday and Fiesta Friday…go check it out and then go visit some other great sites! I love sweet, spicy, and salty all mixed up together, especially in “sandwich” form like this. Pinned, and can’t wait to try this unique recipe! These looks delicious. Wonderful leftover dish. Thanks so much for stopping by the blog. Happy Fiesta Friday! This looks amazing Linda! Wow I want some now! What a great use of leftovers! Wonderfully tasty and good looking! A GREAT leftover creation!!! YUM! I love it when this happens! Win-win! I’m ALWAYS looking for variations of quesadillas. This just made the list!!! This is how you do leftovers! Looks really yummy! I LOVE when the leftovers come together! You’ve outdone yourself this time – what a wonderful flavor combination!